Divisions and differences are becoming more apparent and relevant in America’s cultural landscape. One of these schisms is rural America vs. urban America. In one Wall Street Journal article, this topic is explored through the perspective of a Fountain County, Indiana native who moved to the Bay Area. She was one of the first to recognize this difference having lived and belonged to both sides. This issue was more publicly realized after the most recent presidential election when urban areas, who mostly voted for Clinton, saw how Trump was able to capitalize on rural America. (1) So, who even lives in rural America? 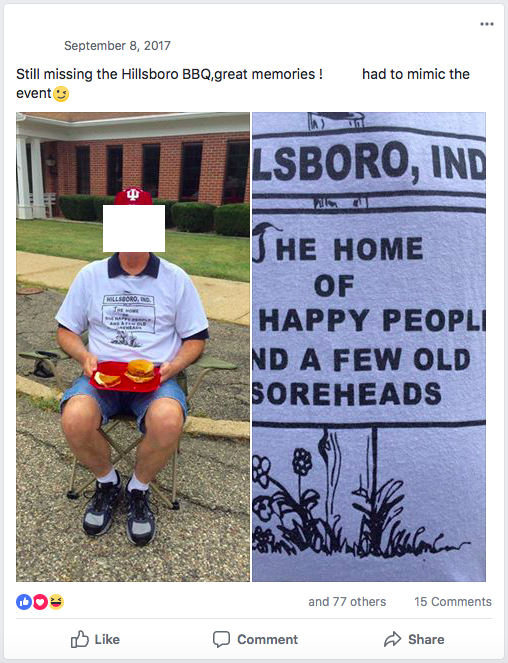 The online community that I have chosen to profile is a public Facebook group named “You know you are from Hillsboro Indiana if....” This online group reflects the physical town of Hillsboro, Indiana – located in Fountain County. The group has 462 members and was created in August of 2011. Since then, it has become a place for residents to share their stories, events, or old pictures related to the community. Although I joined the group recently, March 29th, I have known about it for a long time. Most of my mutual friends in the group are my extended family members; in fact, minutes after I requested to join the group, my uncle approved my request. I think this page allows anyone, whether they are from rural or urban America, to see some of the inner workings of a community that has been nationally typecast as small-minded and ignorant.​My perspective is similar to the woman’s in the WSJ article because I grew up in this community and moved to the Dallas-Fort Worth metropolis to continue my education. I have seen first-hand some of the fundamental differences in the values and lifestyles shared by members of these two types of communities. In this analysis, my goal is to share a deeper look into one community’s online gathering space and how this relates to what they are often perceived as. Most of the group’s members are 50 years and older. I observed this while scrolling through the list of members. This is important to recognize because it shapes the rhetoric and dialogue found on the page. In an article published by Newsweek, one authored projected that young people are leaving Facebook as more and more older people become connected. (2) Older users typically use more formal language and post things that don’t follow what young people consider socially acceptable. This can be attributed to the fact the younger generation has more developed skills in communicating online. We use multiple social media platforms and understand the nuances that govern each platform like what, when, and how to post to each individual site. The older generation does not have this same knowledge. They typically only use one site, Facebook, so they do not know the social norms for navigating this particular platform. (2) This is evident when one looks at some of the typical interactions between the older generation and other users on the site. Regardless of age, most users have one thing in common; they use Facebook to connect with friends, old and new. In a study done by researchers at Pennsylvania State University, “older people enjoy the same things their younger counterparts do: using Facebook to bond with old friends and develop relationships with like-minded people.” (3) This article from the New York Times helps frame most of the growth that this small-town page has seen. The dynamic changes from simple posts about personal memories to uploading photographs of unknown war veterans leaving the members with the power to discuss and research the identities of these special people. “As Facebook continues to be a bigger part of American life, the ever-growing population of older Americans is figuring out how to adapt.” This particular page is tiny and specific; it will probably never grow to a substantial size or be seen by the rest of the world. Through my analysis, my purpose is to show how this page connects a community and why it is important to the town’s living memory. ​The screen captures above are examples of some of the first posts in the group. I have decided to protect the identity of the people in this page because, although the page is accessible to the public, they didn’t post with the whole world in mind. As one can see, they follow the "You know you're from Hillsboro, Indiana if..." statement by creating a response to the page’s name. There are many posts like this from the early days that this page existed but they gradually become less frequent. Now, there are new posts about once every two weeks. 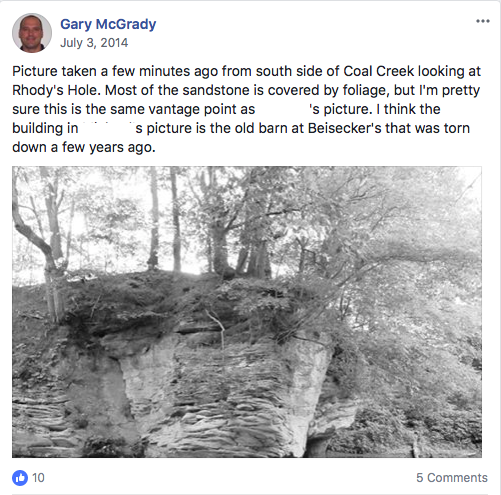 ​In order to take a deeper look at some of the unique aspects of this page, I conducted an interview with Gary McGrady, a Hillsboro native who has been a member of the group since 2011 and a member of the physical community for over 50 years. While asking him a variety of questions about the online community, one thing is clear: he has a passion for Hillsboro history and the people who currently reside there. McGrady describes his purpose in the group, “Sometimes I answer historical questions, and share photos/videos.” (4) ​He doesn’t post his own content very often but when he does, members appreciate his input and the thoroughness of his answers. Above is an example of how McGrady is involved in the page. 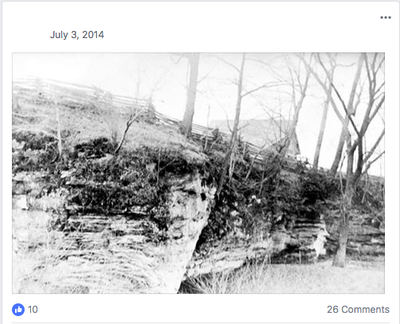 The original post (top left) is ordinary for this page: an old photograph of a landscape. As one can see from the amount of comments, this post generated a lot of interaction. 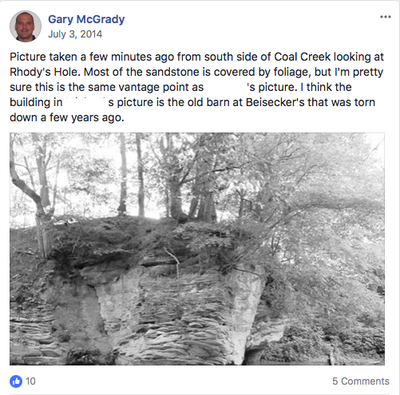 An outsider of this community probably wouldn’t think much of an ordinary looking bluff, but the people of this page recognize it and celebrate the different memories each of them had there. McGrady posted a response to the questions in the comments about where the bluff is today. 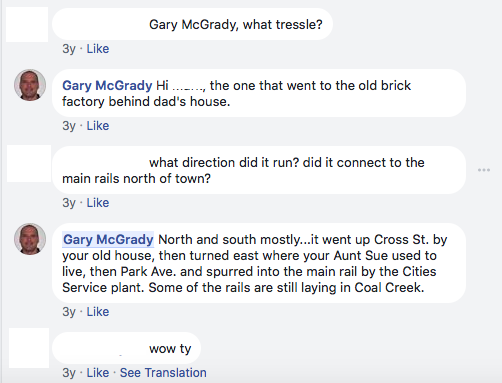 He also responded to the comments with great detail and insight to this particular location’s unique history. 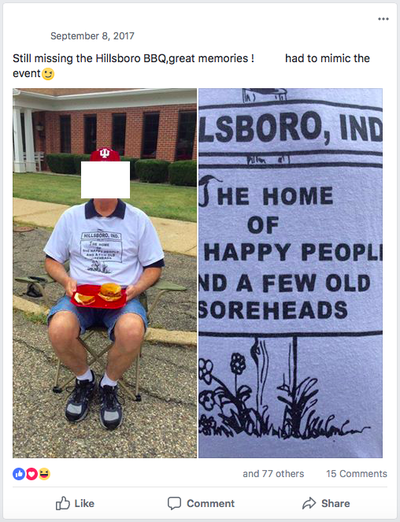 This post may seem extraordinary for a small town’s online gathering place and outsiders may rhetorically ask, “Who cares?” Well, in short, the people of Hillsboro, Indiana do. Living there is more than just living in a small town. Living there is also being surrounded by folks who are generous and want to share their stories and experiences with everyone. The main purpose of this page is for community members to gather online and feel welcome to share their questions, promote their events, or post personal experiences relevant to growing up in Hillsboro. 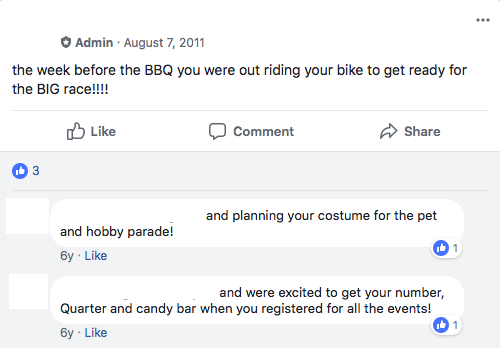 While the BBQ’s demise is an unfortunate end to a wonderful tradition, it continues to bond the members of the online community every year. In the picture below, this past year, one resident got a tray of classic Hillsboro BBQ staples and sat outside the bank – where the big tent usually is set up. 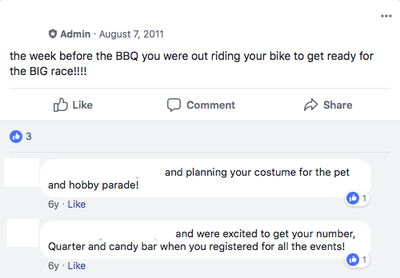 This is one of the most liked posts on the entire group which shows a common feeling of missing this cherished event. The BBQ is an example of how something that happened in the physical community affects the online community. It shapes their conversation for a week every year and helps bond the members of the page because almost everyone has an experience to share. The picture above (right) is of me when I participated in the various events held at the BBQ. It was a time when I could run around and play with my friends for a whole weekend. I loved it and now I get to connect with other residents because, I too, grew up with it. For a younger member like me, these connections are scarce. While I grew up in the same town, the cultural landscape has changed significantly. 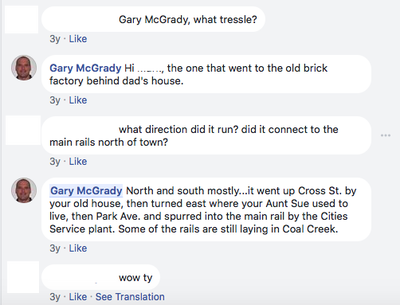 Most of the posts and conversations are between older members. There is a fair amount of other younger members but they never post; they only like and sometimes comment. This is due to the common themes one can observe from scrolling through: old yearbook photos, newspaper clippings, and various memorabilia. Young members have a hard time connecting with most of the things that are shared. Although we can’t connect directly, we can still embrace the history that is being told through stories and photographs. This page is one way that Hillsboro’s history is being preserved and passed down. So, why is this important, especially in today’s fast-paced and urban culture? 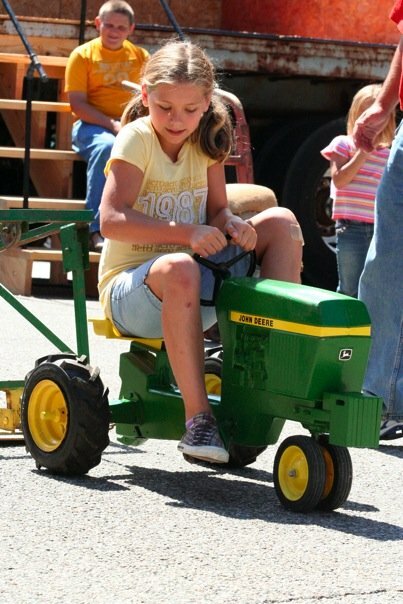 It is important to recognize the growth that rural America has seen and how they continue to adapt the advances in technology to better preserve the traditions that characterize each individual area. Platforms like Facebook have provided the means to keeping this rich history alive. Phillips, Michael M. “In a Divided Nation of Big Cities and Small Towns, Caity Cronkhite Thought She Knew Where She Belonged.” The Wall Street Journal, Dow Jones & Company, 15 Dec. 2017, www.wsj.com/articles/in-a-divided-nation-of-big-cities-and-small-towns-caity-cronkhite-thought-she-knew-where-she-belonged-1513352379.